Recently gun playing is on the rise. It is Nerf (Not nerd), a new type of dart shooting which is safe for kids to play indoors. Nerf uses foam-like material as ammunition and come in variety of gun designs. Not only the kids are playing it but some adults as well. As I was reading up about Nerf, I came across SG Nerf. SG Nerf is a Singapore Nerf collector who reviews the original Nerf brand blasters which can easily found at most major dept toy stores. He have a list of review and some with video too. Some of his picture really capture my attention. As I read more, I found the author have another 2 related blog regarding Nerf guns. SG Toys is about non-Nerf/3rd-party brand blasters which are only found in selected shops. While Mod works is the sharing of his customisation guides of the Nerf guns. On the latest entry currently, he D.I.Y a Tommy Nerf Gun and shield! How cool was that? He has even provide and update a retail pricing of Nerf guns found in Singapore. It come to my attention there was a existing Singapore Nerf community who plan and organized nerf games in teams. As old as I am, some of the Nerf guns design really appeal to me. Here are some of them after repainting. Wow never knew they look so cool after some painting! I've actually been looking at some airsoft guns a while ago, but found out they were illegal to import to Canada. I actually just like the guns style and wanted to display them, not really play with them. I am going to check out SG Nerf now! The repainted guns are very cool. Singapore had banned those air pellet guns as well. But Nerf is alright. I also go for the gun style. The price is quite alright here. Nerf available at Canada? Yup, but I don't really know the price because I never purposely go check them out. Wow...the repaint are so cool...I can imagine them hanging on the wall...wah lau very cool!!!!! But how to paint...LOL??? can we use spray cans or must have airbrush?? Jcee you should be experience as you do scale models. Yes LittlePlasticMan, repainting is a question that is on my mind too and we need someone to share on that. I assume Jcee should have enough of experience to do that too. Any repaint guru can give some pointers? I think any spray paint for plastic models will do. You'd probably want a "Flat" overcoat on the black/grey to protect it and give it the flat color look instead of shiny. Thanks for the tips Jcee. If you are doing the repainting on your Maverick, share with us. Like those commented earlier, the repainted black Nerf guns looks cool! They look like high-tec weapons from games like HALO! Impressive. That precisely why I love the repainted ones. One of the gun can break apart and form different guns like Recon CS-6 and Longshot C-6. When my wife and I were shopping for houses last week, I spotted a Nerf dart way up on a high light fixture. It would take a collapsable ladder to get that thing down! Well that happen when some kids went mindless shooting. It is a common sight. Did you get that house? I hope that will not be the reason for you not to get it tho. I don't have one yet. But I'll be looking out for a Maverick one next time I am at the store. What sci-fi gun looks like the Maverick? Haha that looks pretty cool! Do you know a place to check out custom paint jobs for the Nerf guns? 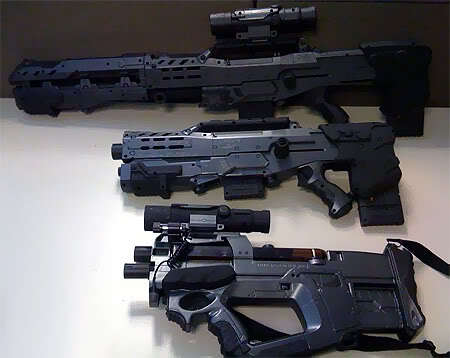 Hi Jcee... a quick inspiration from sci-fi/comic guns, check out HellBoy's samaritan pistol and big baby shotgun, the Nerf Maverick has similiar design cues.